Lieutenant Rettberg died in a helicopter accident. At approximately 2 p.m., the 58-year-old victim and civilian mechanic Thomas Bahoravitch were performing a maintenance check of a Bell Jet Ranger helicopter near 1500 South and Redwood Road. Witnesses say that a part separated from the aircraft while it was performing a practice dive. Instead of recovering from the dive, the aircraft slammed into a muddy embankment killing both occupants. 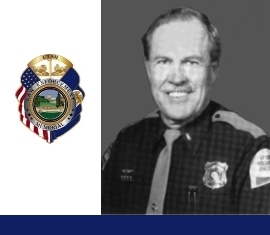 Lt. Rettberg was married and the father of three daughters. He was cremated and his ashes scattered across the eastern slopes of Mount Timpanogos. His bronze name plaque is sponsored by the Utah Highway Patrol Association. I am writing a report on Mr.Rettberg for my school.I would like to say thank you to him for all that he did. Hey Captain, miss hearing that bird in the sky. Stay safe up there and God bless you for all that you did for the citizens of Utah. Your Martial Arts Pal, Steve……………………..
You are missed every day. I always wonder what life would be like of you were here. I wish my daughter could get to know you. She will know you and how fun you were. We love you and miss you always. I have a lot more money now that you aren’t taking it all on the golf course. I bet you are now playing some beautiful courses. Thanks for your dedicated service to the citizens of Utah. I worked with Lt. Rettberg back in the late 1980’s and early 90’s when I was a DEA Special Agent assigned to Salt Lake City, Utah. He was an outstanding man and a “can do” guy that was always on top of his game! He was one of the best Pilots I ever flew missions with. I thank God for the opportunity to have worked with this Hero. May God bless his family that remains.